Produced by Britain’s Channel 4 in 1993, this ground-breaking television miniseries created an uproar when it aired on PBS the following year. Adapted from Maupin’s first novel and starring Olympia Dukakis and Laura Linney, the drama shattered precedent by depicting the love lives of gay and straight characters alike. This provoked official condemnations from the legislatures of Georgia, South Carolina and Oklahoma—and a bomb threat at the PBS station in Chattanooga, Tennessee. “Armistead Maupin’s Tales of the City” received record-high ratings, Best Miniseries recognition from the National Board of Review, two major Emmy nominations and television’s most prestigious honor, the Peabody Award. Nevertheless, PBS bowed to conservative pressure and dumped its plans for a sequel. The second of Maupin’s three miniseries, “Armistead Maupin’s More Tales of the City” was produced by Showtime in 1998 after PBS caved in to pressure from the religious right and chose not to continue the saga. It was nominated for five Emmy awards, including Outstanding Miniseries and Outstanding Lead Actress (Olympia Dukakis). The last of the three miniseries based on the Tales books was co-written by Maupin and James Lecesne and received an Emmy nomination for Outstanding Miniseries. Though it follows the adventure-driven storyline of the original novel, it offers some noteworthy additions and elaborations—with the author’s blessing. ● The closeted movie star inspired by Maupin’s friendship with Rock Hudson is now called Cage Tyler, since his name was indicated only by blanks in the novel. ● Unlike the novel, the miniseries provides a love interest for Anna Madrigal. Olympia Dukakis had requested this change herself but later joked that Maupin had given her more—and less—than she had bargained for. ● Due to the popularity of Jackie Burroughs in the role of Mother Mucca, Maupin departs from the novel and brings the cranky old madam back for another round. A mysterious and troubling phone friendship inspired Armistead Maupin to write the bestselling novel on which this psychological thriller is based. 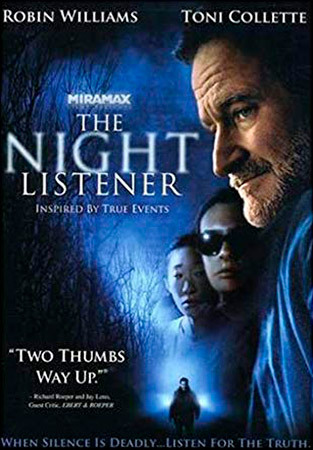 Robin Williams plays Maupin’s alter ego, Gabriel Noone, a radio storyteller who offers fatherly counsel to a young boy on the verge of death. Toni Collette, in one of her eeriest performances, plays the boy’s zealous guardian. Directed by Patrick Stettner, the film debuted at the Sundance Film Festival and was distributed by Miramax Films. After its release, an investigation by ABC News 20/20 unraveled the real-life mystery, finally providing Maupin with answers he didn’t have when he sat down to write the novel. Armistead Maupin wrote Lily Tomlin’s narration for this pioneering documentary on Hollywood’s treatment of homosexual characters in the 20th century. Based on the seminal book by Vito Russo and produced by the Oscar-winning team of Rob Epstein and Jeffrey Friedman, “The Celluloid Closet” presents clips from over a hundred mainstream films, illustrating the ways in which gays and lesbians were repeatedly depicted as either tragic figures, buffoons or monsters. Maupin is among the interview subjects, along with Tony Curtis, Tom Hanks, Susie Bright, Susan Sarandon, Whoopi Goldberg, Gore Vidal and others.